Bushranger 4×4 Gear is excited to announce the launch of our all new, Australian designed and engineered, 10,000lb REVO Vehicle Recovery Winch, which is sure to shake things up in the Aussie 4×4 aftermarket scene. Boasting market leading performance, high quality construction along with unique design features, not to mention the durability, reliability and affordability built into every one of our 4×4 accessories, now you can own one of the best vehicle recovery winches available today. The development of the all new Bushranger REVO 10 winch began after years of feedback from our customers about our highly regarded DV and SEAL series winches……’Awesome winch, we just wish it was cheaper’. 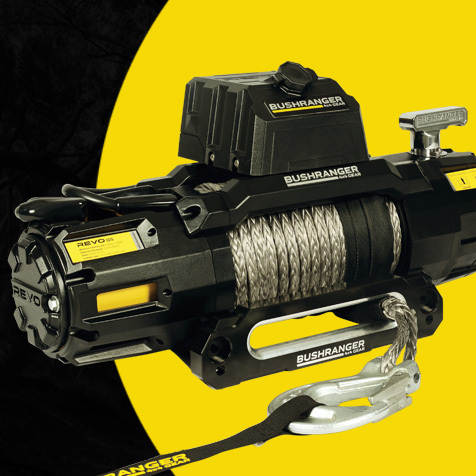 Anyone who has ever owned or used a Bushranger winch can testify to its superior performance and reliability over the cheap, re-badged winches that choke the market. Look around and you will see the same winch sold by many well-known stores and online resellers who take a basic, off the shelf product and slap a sticker on it, with the price ranging anywhere from budget to premium depending on how much money they want to make. There’s no sound engineering, there’s no strict testing criteria and there’s little to no warranty or after sales support on offer. Basically, you make the purchase and cross your fingers that it will work when you need it most. We set out to do something different and develop a brand-new winch, which matched or improved upon our current range, but was more affordable for our strong customer base……..a tough task which would require a ground up rethink and plenty of R&D. We researched, we designed, we consulted and we developed. It quickly became apparent that we could achieve our goals with a feature packed product that not only matched our current range, but also exceeded many well-known, premium brand winches on the market. A strong collaboration between our winch manufacturer and our team of engineers has driven this project from the beginning. On paper, achieving our target specifications was not that hard, in fact the majority of winches on the market, from budget to premium, will generally be able to do what they claim………well, in terms of pulling force anyway. How that pulling force is achieved, in terms of the line speeds, the current draw, the braking system, the heat generation, the material selection and the long term reliability…….all of these things are what differentiate the superior winches from the inferior winches. Aiming for the upper end of the market, we targeted high line speeds, low current draw and an efficient braking system that would all work together to achieve an ultra-reliable, premium spec’d winch at an affordable price point……. basically, a winch that would set itself apart from the competition. Starting with the motor and gearbox design, we quickly found that standard manufacturer items were not going to cut it in terms of efficiency and sizing constraints. The ability for the winch to fit into the compact dimensions offered on a wide variety of bull bars was a huge design requirement and this meant that large, powerful (and usually inefficient) motors, which are readily available, would not be suitable. A custom designed and up spec’d 12V motor needed to be developed and had to work harmoniously with the gearbox side to achieve the correct line pull with the low current draw and fast line speeds that we desired. After 4 design iterations and multiple bench tests of each, we ended up with a relatively compact, highly efficient motor using premium materials, and mated it to a customised, strong and durable, 4 stage gearbox end, boasting oversized gears (for maximum strength and long-term reliability) and a unique braking system that stands out from the rest. The braking system designed into the Bushranger REVO 10 allows it to really shine in its performance and usability. A winches braking system has a significant impact on the design of other major components, such as the electric motor, gearbox and rope selection, with the increasingly popular synthetic ropes suffering most from cheap and nasty brake system configurations. Take a look at the detailed specs for many of the winches available from big name stores or online and you will find the terms ‘Automatic In Drum Brake’, ‘Automatic Out of Drum Brake’ or other iterations of the same term. Basically, these types of spring loaded, friction pad braking systems apply pressure against the drum (or just outside of it) to stop it rotating when holding the weight of the vehicle, however, they also create friction when powering in and powering out. This means that the brake is always dragging, no matter which way the winch is rotating, leading to increased work for the motor (which generates higher current draw and more heat) and direct heat transfer from the braking system to the drum………a big no no for winches using synthetic rope. Our unique, 100% load holding, proportional friction braking system is mounted in the end of the gearbox, as far away from the drum and synthetic rope as possible, meaning zero heat transfer from the brake to the rope because the brake does not act against the drum. This is a huge benefit for the life of your synthetic rope, but it doesn’t stop there. The innovative brake design also allows for zero brake drag when powering in, improving motor efficiency and reducing heat generation further, and zero brake drag when powering out under no load, meaning you can let the winch do the work for you when hooking up your rope to the anchor point. Gone are the days of the tiring effort put into unspooling the rope by hand, especially on steep hills or boggy mud holes. Save the hassle, REVO will win the battle for you……and it will do it quick; at 15m/min line speed during no load unspooling, its faster than you can unwind the rope by hand. To top it off, the unique braking system is much safer, with the Dual Lock, 100% load holding design ensuring there is no slippage; the winch remains solidly locked all the way up to the rated pulling capacity, unlike many traditionally braked winches on the market! If you do decide to unspool the rope by hand, we have incorporated a “No Lift”, easy to turn clutch mechanism, that uncouples the gear train without fuss for free spool operation. The clutch pin engages and disengages the rotating ring gear, which will not bind up like inferior sliding ring gear mechanisms do, allowing for trouble free operation for the life of the winch. Ease of operation is also improved with the cam style clutch lever lifting the clutch pin automatically for you meaning that there is no more awkward “lift and turn” operation, particularly useful in those tight bulbar cavities. To keep all of the internals working smoothly and reliably for the life of the winch, we have concentrated heavily on incorporating high quality seals into the winch design, ensuring an IP67 rating for the motor, gearbox, contactor and hand controller, meaning the components are dustproof and waterproof and able to be submersed in 1m depth of water for up to 30 minutes with no harmful effects. This will put your mind at ease when tackling those tricky river crossings or muddy swamp holes. The contactor is a 500A rated unit, which is purposely oversized for the winches requirements to ensure long term durability and efficient, high performance. It is permanently sealed to ensure no chance of water or dust ingress and will provide reliable operation no matter what you throw at it. We love 4WD gear that not only works well, but also looks the goods, and the Bushranger REVO is no exception here. We wanted to move away from the generic, 1980’s winch look, and create a striking aesthetic to complement its impressive performance. From the unique, open style motor cover, to the beefy gearbox casings and the unique, step up cross bars, we believe this is the most modern and tough looking winch on the market. We’ve also carried the same styling cues over to the control box, to improve the integration with the front of modern vehicles; but we have done more than just concentrate on its styling. We’ve made a concentrated effort to make this control box the most versatile on the market, developing a true, multi fit design that isn’t just a tacked-on afterthought. The control box can be mounted horizontally or vertically to the bull bar, on a separate control box mounting bracket (included in the kit) or directly on the top of the winch for hi-mount applications. Further to this, there are also multiple cable routing options to ensure ease of fitment, even in the tightest of spaces. Speaking of ease of fitment, the overall width of the winch and adjustability of the motor and gearbox ends, go a long way to helping with the ease of the installation process. With an overall width of only 583mm, the winch is significantly narrower than our previous range, and will better suit the vast majority of bull bar mounting applications. The rotation of the clutch handle does not require the winch to be fully disassembled, as is common on many winches, and can be clocked in 16 different positions (at 22.5° increments), to give ultimate flexibility for clutch handle location. The motor can also be rotated in 90° increments to position the motor poles in the most ideal location for the install. The Bushranger REVO winch is available in a 10,000lb pulling capacity, with a 12,500lb version being developed for the future. There are two variants on offer; a standard 10W, Wire rope version with a Roller Fairlead and Wired Hand Controller and the premium 10S, Synthetic rope version with Hawse Fairlead and Wireless Hand Controller. Both offer outstanding value for money and market leading performance. The REVO 10W, wire rope version utilises 28m of durable and strong 9.2mm steel cable with a removable 3/8” clevis hook fitted to the end. The wire is fed through a unique, stainless steel roller fairlead, which will not peel and rust like the majority of chrome plated steel varieties on the market, keeping the front of your vehicle looking smart, even after countless recoveries. Control of the winch is via our modern, ergonomic and waterproof wired hand controller, with 5m of cable giving plenty of reach. The REVO 10S, synthetic rope version utilises 28m of high grade, 10mm synthetic rope, which is 1/7th the weight of equivalent diameter wire rope but does no kink, curl or splinter. Through our strict quality control procedures, we randomly test ropes from every batch to ensure consistency and safety for every one of our winches and our testing confirms the repeat-ability and strength that we have achieved by using a quality synthetic rope. We’ve also included a heavy duty nylon sleeve on the end of the rope to help protect it from damage and a removable, ½” clevis hook which is the strongest component in the winch kit. Our unique, two position hawse fairlead concept has been retained from our previous model, but we’ve modernised the look and made it sexier than ever. Suitable for inline and offset mounting holes, it will suit the majority of vehicles and, being made from aircraft grade aluminium, means that you will have a quality, long lasting fairlead that will stand up to any recovery. The REVO hand controllers offer an ergonomic interface to operate the winch and are small enough to tuck neatly away in your pocket or glove box. The wired version operates using a 5m cable and an easy to use, 2 button control panel for power out and power in. This simple control setup is continued into the wireless hand controller, but with the addition of an internal battery, auto-off functionality and a 433MHz wireless module, which gives plenty of operating range and meets strict Australian standards for short range, wireless devices. Being a company driven by producing quality, engineered products, we did not hold back on carrying out extensive validation testing to ensure that what we had created on paper did in fact translate into real and tangible results in the field. Above all, we wanted to release a safe and reliable winch that could also perform with the best on the market. Final Bushranger REVO Winch testing in the rolling hills of Mt Hunter, NSW. It was a dry and dusty day this one. We have carried out a mixture of laboratory testing and in field testing, with the test setups ranging from large, 300T NATA accredited test machines to a humble 80 series Landcruiser. We’ve pulled and broken countless ropes, hooks and winches; to stall point, to proof load, to breaking capacity…..you name it, we’ve tested it. We’ve IP tested, EMC tested, EN tested. We’ve run in field endurance testing, cycling through winch IN and winch OUT operations over and over and over, checking for breaking points, looking for motor burnouts, experiencing brake drag and failure. We’ve tested back to back with other big name players on the market and compared performance and failure points in the process. Time and time again, the REVO stands up and excels against the competitors and we couldn’t be happier. Final Rig testing prior to production June 2018. So happy in fact, that we are offering a Limited Lifetime Warranty with a 5 year warranty on the electrical components. We can offer this because we know the strength and reliability that we have built into this product and our 40+ year history of supplying quality engineered 4×4 products to the Australian market will provide you peace of mind that you are engaging with a trusted, bricks and mortar Australian business. If your looking to buy a Bushranger REVO Vehicle Recovery Winch, you can CLICK HERE to read more information. Alternatively our sales team would be more than happy to talk to you on 1800 654 767 or sales@kingsleyenterprises.com.au. Congratulations to John Overton, WA the winner of the WIN A WINCH competition drawn 23.10.18.